When my friends in the Netherlands recently told me about their delicious holiday feasts featuring venison and wild rabbit, I thought: "why not here?" Although I am a self-aspiring vegetarian, I am still nostalgic for the wild game we served at home. It should not too hard to find some good venison around here to eat, should it? After all, the woods around our house are infested with deer. We sometimes literally stumble over Bambi and her family in our back yard. Day and night our dog takes off barking at what our neighbors call, "Rats with antlers." It turns out that I am an optimist. Even though this is a trigger-happy country, and juicy targets are under foot everywhere, it's almost impossible to buy or sell wild venison. If you want to hunt deer, the gun legislation is very strict. It is strictly forbidden to carry a gun with you. The deadliest weaponry permitted is a bow and arrow, and that only a few days a year and only with official authorization. If you play by the rules and sneak through the woods as a counterfeit Native American, you are required to wear a florescent orange suit so bright that the potential quarry can spot you coming from miles away. Thanks to all these rules, there are very few deer who actually get bagged in New Jersey. Once those few dangerous days in the hunting season are over, the deer in our forest breathe a sigh of relief and go back to their normal business of munching our flowers. It does not help to find a local hunter, either. Even if they have stashed away quartered deer steaks in their basement freezer, selling them in New Jersey is strictly prohibited. It is easier to buy an assault weapon designed to kill people than it is to sell venison, which can get you arrested. Andrew, a friend of my son, shares my astonishment. He has just moved from the Deep South, a part of the country where every pickup truck comes equipped with a rifle hung in the rear window and a hunting dog in the back seat. Andrew received his first rifle from his father on his sixth birthday. "During hunting season, I took just bring my gun to school," he says, "where I put it in my locker. And Sunday I took it to church. If my friends and I are hungry, we shoot something for dinner." The next day he brings me a magazine: Outdoor Life, with a magnificent bull elk depicted on the cover. It's called "The Meat Issue" and subtitled "Pursue, kill and feast." From roasting wild animals to the last bite. It's quite a bloody issue, full of instructions for hunters, interspersed with ads for rifles, hunting clothes and menacing knives. Full-page illustrations explain how to butcher and prepare a deer for dining. Quite different from the cookie recipes in Dutch holiday magazines. Andrew then opens to an article about how to prepare road kill. These are deer, pheasants and squirrels who do not pay attention when crossing the street. I once saw in Montana a restaurant called The Road Kill Grill, whose slogan on the menu said, "From Your Grill to Ours." This article is full of useful advice. For example, first insert a stick in the eye of the deer you find on the highway. If it does not blink, it is dead. Also make sure that the animal is well fed and has no rabies. And look out for fleas and ticks, which, like leaving a sinking ship, will jump to a hotter body. All useful to know. Roadkill is indeed for every budget. A deer tastes equally good whether it collided with a Mercedes or a Toyota. "This is also illegal here," Andrew explains with a shrug. "You can not even eat your own deer you run over. Mortal sin. " Eventually I head to the supermarket to do some domestic shopping. 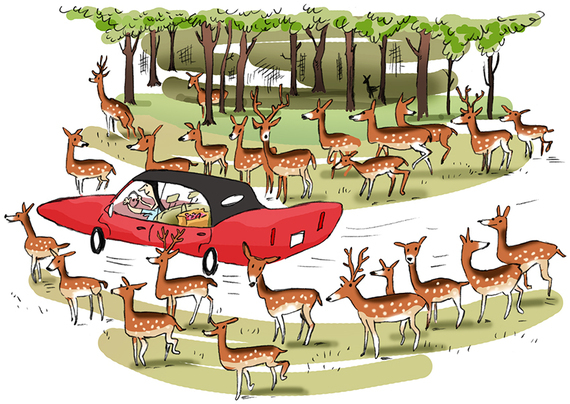 Driving home at night with a pack of pork chops in the trunk, I suddenly encountered a herd of wild venison on the road. I slalomed neatly around it.